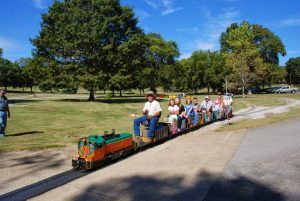 Have you ever wanted to ride a train through Maury County Park? Your chance is coming this spring when the Mid-South Live Steamers come to the park on Thursday-Saturday, May 5-6! Rides are given from 10 am – 4 pm and they are free of charge. During the meet, donation boxes are located at the waiver trailer and on the station platform, if you wish to help with the cost of this fun event. The group provides free rides to the public at their Spring, Fall and Winter meets. The wait time at the passenger station is dependent on weather and the day of the week. The shortest wait times are on Thursday and Friday , with the average wait time being zero – one hour, depending on the crowd size. Saturdays are the busiest day, with lines reaching over 300 passengers at times. The average wait on a Saturday is 1-2 hours, depending on the crowd size. The Mid-South Live Steamers have been around since 1966 and are supported by member dues, member and public donations. The Club is 501(c)(3) tax exempt organization. They receive no tax money from the city, county or state and are not supported by taxpayers in any way. The operation of the steamers can be costly so any public financial support is very much appreciated. 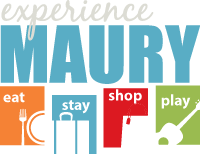 Maury County Park is located at : 1048 Maury County Park Dr, Columbia, TN 38401. You can find more information at their website at http://www.midsouthlivesteamers.com/.